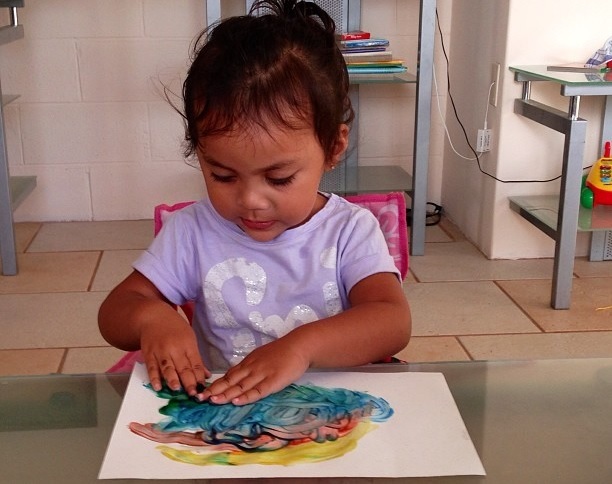 Finger painting without the mess?? Then have your children draw pictures, make handprints, or write letters and words with their finger. Make sure to get all of the extra air out of the bags before taping them down. Fingerpainting works much better with all of the air bubbles removed. Q-tips work great for painting on your fingerprinting bags. Q-tips are soft enough so they won't tear the bag, but sturdy enough to push the paint around easily. Perfect activity for toddlers and up! For babies who can't sit up yet, lay baby tummy down on a Tummy Time Pillow or nursing pillow under baby's chest to allow free hands for play. Youir little ones can paint all day, and the only clean up for you will be un-taping the bag from your table – then you can either throw it away or save it in a safe place for another day.